I love a good prequel, especially when a contemporary playwright decides to take on the back story of a hallowed play by the likes of William Shakespeare. I mean, come on. Daring to tread on that playing field takes some guts because you know before you begin that audiences are going to have high expectations of your work. They also know where you need to end your story in order for Shakespeare’s to begin so getting there must be highly inventive and worthy of its foregone conclusion. 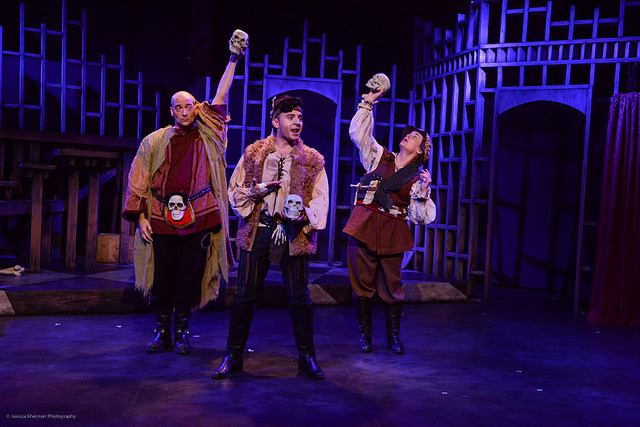 LA-based playwright Michael Shaw Fisher proves he’s up to the task in his latest new work Skullduggery: The Musical Prequel to Hamlet, a rowdy and irreverent precursor to Shakespeare’s revenge play, Hamlet. The musical comedy is a smart contrast in tone that opens up a clever pathway for foreshadowing later events and introducing the quirks of Shakespeare’s dramatic characters, like Ophelia’s (Alyssa Rupert) madness and Polonius’ (Curt Bonnem) convoluted conversation. It also allows for a slew of new characters to emerge that are completely unpredictable. You never know what this bunch of crackpots will do next. Instead of simply the skull of a jester we meet in passing in Hamlet (“Alas, poor Yorick! I knew him, Horatio”) Yorick (scene-stealing Brendan Hunt) is a real person – a falling-down drunkard with more than his fair share of secrets. Hunt doesn’t even have to try to be funny. All he has to do is try to stand up and it becomes a study in how to create an unforgettable character. When his arm gets stuck in a set piece or he slips while walking across the stage, it’s a lesson in improv you can’t pass up. 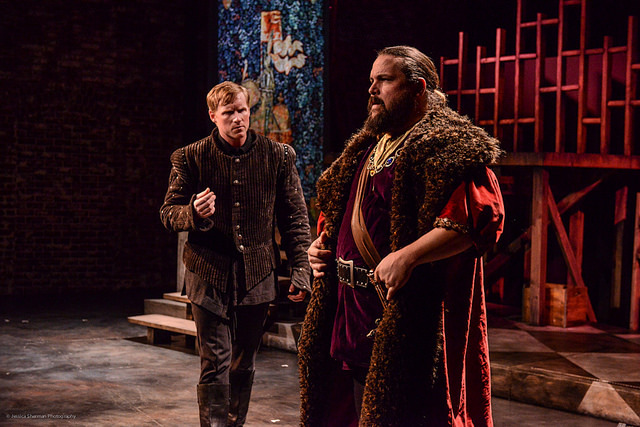 Hamlet Sr. (David Haverty), appearing in Hamlet as a ghost only, is still alive, and three boisterous roustabouts (Jeff Sumner, Matt Valle and Cj Merriman) who will take up new careers as gravediggers before Skullduggery is over will reveal all the mysteries heretofore unsolved. When this show works it works really well and a lot of that is due to the understanding they (and Hunt) have of how to bring the material to life. In truth, it’s the fusion of their acting chops and director Scott Leggett’s terrific ability to wring the funny out of Fisher’s writing that makes Skullduggery so much fun. Each of the three has a distinct personality and role in their lively trio. They sing, they dance, they move like wraiths cloaked in black à la Martha Graham and, whenever they appear, they buoy up the merriment. Leggett’s adept staging and Natasha Norman’s cheeky choreography are a delicious combination that this show wears well. Skullduggery takes place thirty years before Hamlet begins when brothers Claudius (John Bobek) and Hamlet are young men. Claudius and Gertrude (Leigh Wulff) have fallen in love but when Hamlet goes off to war with their father and dear old dad is killed on the battlefield, Hamlet returns and marries her while Claudius is away at school. Seven years later, Claudius comes home to Elsinore and learns the bitter truth. Yorick’s uncanny ability to predict the future eventually convinces Claudius to join him in his drunken revolution to overthrow the now King Hamlet and take back what he lost. Where Hamlet follows the perspective of King Hamlet’s son, Skullduggery is really Claudius’ story of what led up to the murder. Bobek (as Claudius) is a likable leading man with a strong singing voice whose journey begins hesitantly, and is at times quite comical, with his hypoglycemic fainting spells a regular occurrence. As he gains confidence, his earnest demeanor propels him forward until he takes bold action to achieve his desired end. Haverty goes from battle-ready to war-weary and his few moments of vulnerability add depth to a very traditional character. As their object of affection, Wulff looks the part of a regal queen but is acting as though she is in an entirely different play. A scene can be serious in a musical comedy but it still needs to have an intensity behind it that is consistent with the style of the play. And, whether or not an actor is miked (they are not here), it is critical that the audience hears their dialogue. In this case, we can’t hear her and the acting is so internal that it comes across as flat. Rebecca Larsen (Berta) does the same thing in her scenes although her wisecracks do land when we can hear them. Both have a bigger problem swallowing their vocals during their songs which gives them an uncomfortably thin, reedy sound, neck veins straining to reach the notes. 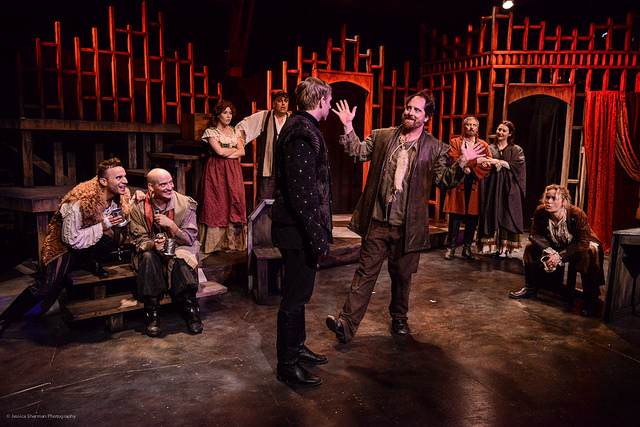 It’s too bad because Fisher’s score is an appealing combination of musical styles that includes everything from electro-funk, Lennon-esque tunes, and Sondheim-inspired verses to Renaissance folk, drinking songs, and sea shanties. I even heard something resembling The Pink Panther hidden in the mix. When it goes all out rock, it’s even better. Musical director Michael Teoli uses instruments you don’t often hear together in a musical to create some cool sound paintings and eerie effects in his arrangements for the show. He features marimba, mandolin, and guitar, and even tuba on “Twenty-Three” at the top of Act II to recap the story and move the audience forward twenty-three years. Vocal harmonies, especially the intentionally dissonant phrases, are deceptively simple and add subtle texture. It’s an artful working of the score that creates a musical world just slightly off enough to catch your ear because it isn’t at all traditional. Lyrically there are nods to popular Shakespeare phrases and a good bit of punning if you listen closely. You’d have to see the show a second time to catch all the Shakespeare in-jokes Fisher has included so keep your ear tuned. Sacred Fools’ new Hollywood venue is a step up from their previous location for this kind of musical adventure and the creative team has done some impressive work here. DeAnne Millais’ polished scenic design features open wooden panels, a curved staircase, and some highly effective scene painting (by Joyce Hutter) to bring the Elizabethan era’s stone and bone to life. A cabinet of skulls does double duty stage left while a fabric panel hanging stage right makes tapestry changes via Ben Rock’s rich video projections to further enhance locations. Gorgeous costumes by Linda Muggeridge look expensive under Andrew Schmedake’s saturated lighting design. 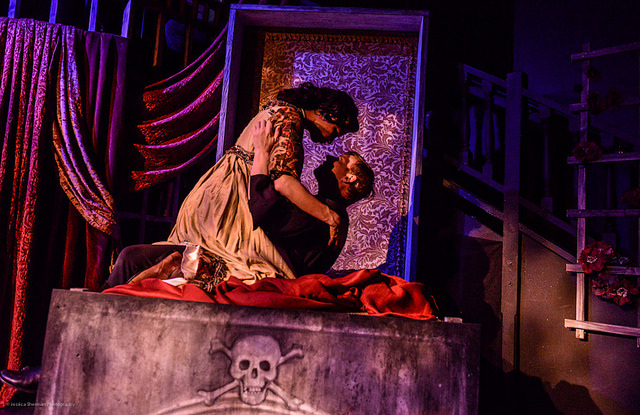 Making Shakespeare a good time isn’t always easy but Skullduggery: The Musical Prequel to Hamlet accomplishes that goal and delivers an exhilarating crowd-pleaser. The laughs are infectious, the fun factor high. Maybe every Shakespearean tragedy should come with a comedy prequel. I am *very* tempted to see this show a second time to catch all the in-jokes I know I missed the first time! Agree with you on sound issues for hearing all the lyrics all the time, but Michael Shaw Fisher has another winner, and the entire creative team is to be congratulated for an excellent production.